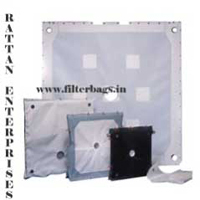 The company is the chief Filter Press Cloth Panel Manufacturer, Exporter, and Supplier in India. Filter presses are among the most versatile of all liquid-solid separation unit operations. A filter press contains a series of plates with a filtering surface on both sides. These plates are covered with a Filter Press Cloth Panel. Many of these plates are pushed together to form chambers with sufficient filtration area for the application. Slurry is forced into the chamber. The press cloth allows the filtrate to pass through, dewatering the filter cake, which forms on the Filter Press Cloth Panel. The cake is discharged by pulling the plates apart. The cycle then repeats itself. We offer highly efficient and reliable Filter Press Cloth Panel, which is easily available in various sizes and dimensions.